For the fourth straight year, the University of the Fraser Valley men’s basketball team is headed to the Canada West Final Four. The tournament will take place at the University of Saskatchewan next weekend. The Canada West Final Four begins Friday at the PAC. The Cascades will meet the Victoria Vikes will meet in the first semifinal at 6 pm Saskatchewan time (4 pm BC time), while the Huskies will host the UBC Thunderbirds at 8 pm in the other semifinal (6 pm BC time). The bronze medal match will be Saturday at 6 pm (4 pm BC time). Tipoff in the championship game is at 8 pm (6 pm BC time). The Cascades punched their ticket on Saturday evening at the Envision Athletic Centre, beating the Calgary Dinos 72-65 to complete a two-game sweep of their best-of-three quarter-final series. 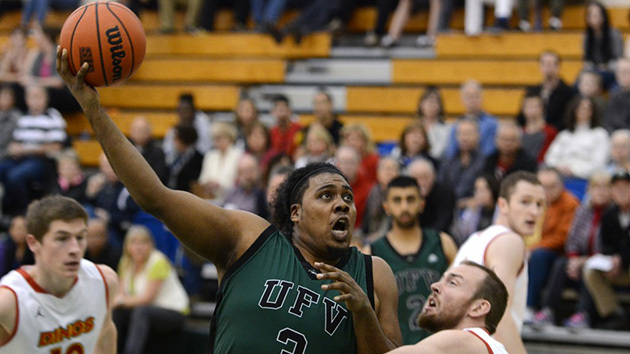 UFV, coming off a 78-71 win on Friday, looked to have Game 2 well in hand – they led by 23 points (54-31) with less than three minutes remaining in the third quarter after Manny Dulay swished a three-pointer. But the Dinos clawed nearly all the way back, drawing to within 67-65 after Jhony Verrone made a layup with 1:27 left in regulation.